Intelligence reports from the Force Recon detachment sent to Haulover confirm that the Skinks are behind the mysterious destruction of outlying homesteads and the disappearance of their people. Force Recon initially estimates that the Skinks are present in corps strength. General Anders Aguinaldo, formerly Commandant of the Confederation Marine Corps, now commander of the anti-Skink task force, deploys a corps to deal with them, and soon after deploys a second corps. Each corps consists of four Army divisions and two Marine FISTS. The Navy contributes four aircraft carriers to the operation. Yes, it's a big operation. Big enough that Aguinaldo goes to Haulover himself to run it. It's a hairy mission for the Marines of 34th FIST, but they prevail. 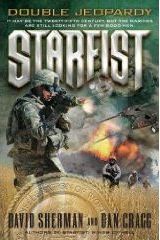 This book follows immediately on the events in Starfist, Force Recon; Recoil. Wings of Hell is available in paperback now. Double Jeopardy takes the Marines of 34th FIST into a never-never they aren't quite prepared for, though they've met its like before. Hint: They are deployed thinking they'll be facing the Skinks again. . . But when they look at the limited intelligence they have, it doesn't add up. What they find when they arrive on the desert world of Ishtar is human mercenaries running gem mines, using indigenous animals for labor. The Marines quickly enough learn that the "intelligent animals" are sentient. They then find themselves in violent conflict with both the natives and the mercenaries. Unfortunately, there won't be a Starfist book 15. The bean counters at the publisher decided that even though the series had been making a profit almost from the first week it was published, it wasn't making a big enough profit, so they don't want it anymore.